I tend to go through food phases, I find a combination that I like and then I eat it over and over until something else catches my fancy. A month ago it was plain Greek yogurt with honey, then homemade peppermint hot cocoa, then I moved on to brie and water crackers, and now I am all about this sandwich! You guys, this sandwich is out of this world good! In a large saute pan over medium heat add onions and 1 T butter. Stir often and cook until caramelized. Preheat the griddle or pan that you will use to cook your grilled cheese. 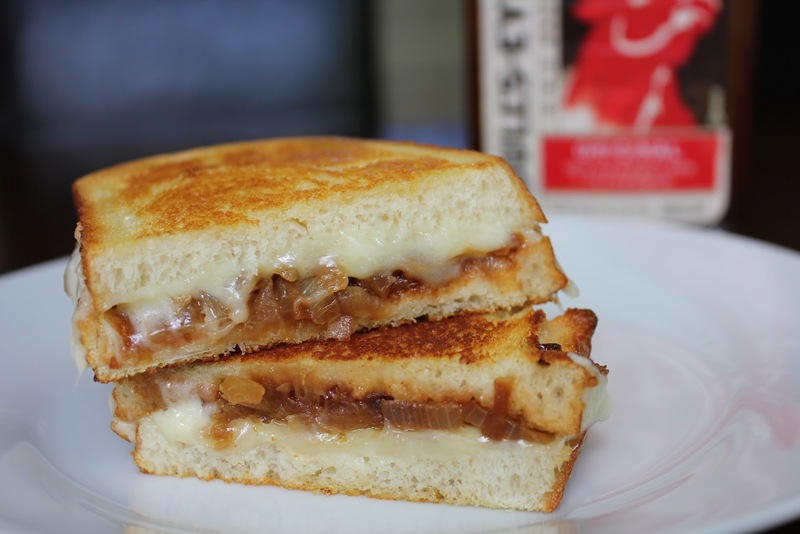 Spread a layer of BBQ sauce on one of your bread pieces, top with caramelized onions, a layer of cheese and then remaining piece of bread. Spread top piece of bread with butter and then place sandwich buttered side down on your griddle. Spread butter on the now top side of your bread. Loosely cover sandwich with foil to help cheese melt. Flip once bottom side is golden brown and continue to cook until other side is golden brown.